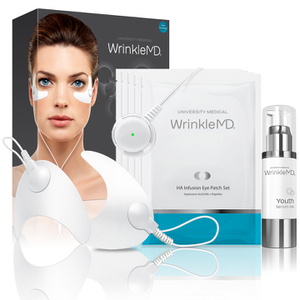 The first and only of its kind, WrinkleMD changes everything about anti-aging skin care. Using gentle Ion-Infusion Technology, this breakthrough at-home product effectively delivers peptides and medical-grade Hyaluronic Acid (HA), the same primary ingredient found in the wrinkle fillers used by dermatologists, deep into the skin for a significant reduction in the appearance of wrinkles. This device is comfortable, easy to use, and hands-free. Provides 15x greater reduction in the appearance of wrinkles than the leading anti-wrinkle serum. Reduces the appearance of wrinkles in as little as two weeks. Leaves skin refreshed, radiant and deeply hydrated. Activator Pod with two year warranty. Thoroughly cleanse and dry skin. Attach the Connector Buds to the HA Infusion Patches. Apply patches, wear for 30 minutes, and dispose. Follow with Youth Serum HA to extend results. Use twice a week for the first week, then once a week for continued results. HA Infusion Patch Ingredients: Glycerin, Potassium Acrylate-Co-Diacetone Acrylamide, Water, Dipeptide Diaminobutyroyl Benzylamide Diacetate, Saccharomyces Lysate Extract, Hyaluronic Acid, Hydroxypropyl Cyclodextrin, Palmitoyl Tripeptide-38, 2-Hydroxy-2-Methyl-1Phenyl Propan-1-One, 4-Methoxyphenol. Youth Serum HA Ingredients: Deionized Water, Dimethicone, Xylitiylglucoside, Anhydroxylitol, Xylitol, Avena Sativa (Oat) Kernel Extract, Hydroxyethylacrylate/Sodium Acryloyldimethyltaurate Copolymer, Squalane, Polysorbate 60, Glycerin, Hydroxypropyl Cyclodextrin, Palmitoyl Tripeptide-38, C12-15 Alkyl Benzoate, Tribehenin, Ceramide-2, PEG 10 Rapeseed Sterol, Palmitoyl Oligopeptide, Saccharomyces Lysate Extract, Dipeptide Diaminobutyroyl Benzylamide Diacetate, Sodium Carboxymethyl Betaglucan, Phenoxyethanol, Sodium Hyaluronate, Panthenol (ProVitamin B5), Mica, Titanium Dioxide, Palmitoyl peptide. The result is so good especially to reduce winkle around eye cycle. Althought the price is not so nice, but comparing the result, it worth to buy.